Welcome to our first ever SimplyAnalytics blog! Every Friday we’ll post a write up on a specific feature or highlight some interesting data in SimplyAnalytics. The goal of these posts is to make you more comfortable with the program and teach some interesting tips & tricks along the way. Today we’ll take a look at the 3 methods of browsing and searching for businesses, and how to take advantage of each. Let’s get started! 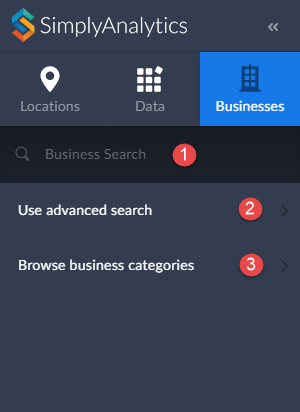 To overlay businesses onto a map or create a Business report, first ensure you have the Businesses tab selected as shown here. As noted above, there are three ways of adding businesses.